K2 blackpoint has now been released. I have known about it but was told to keep quiet about it. Now it is out and I am extremely excited. I will make time soon to try out the beta bits that I have access to and get some information out there. So what is K2 blackpoint? It is K2 response to providing workflow environment that power business and technical users can author workflows. It is skinned in a MS office look and feel environment. Check out the blackpoint website to get some more information. K2 blackpoint provides this perfect middle ground between K2 blackpearl and SharePoint Designer/WF workflows (comparing blackpearl to WF). The deal is this. Building workflow in SharePoint Designer is flat out limited in scope and scalability. Building in WF requires a significant effort. 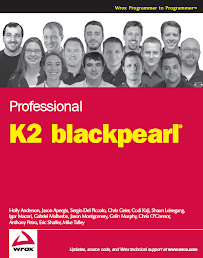 Building in K2 blackpearl gets you past many of the challenges of WF however it still requires some effort and knowledge with Visual Studio. K2 blackpoint provides SharePoint users the ability to build workflows that can pretty much do anything with MOSS. The cost of K2 blackpoint is awesome. Pretty much a no brainer. I am so excited about this! So what is the real difference between K2 blackpoint and blackpearl? I equate it to the difference between WSS 3.0 and MOSS. The comparison worksheet on blackpoint website spells it all out. So what's in K2 blackpoint? Deployable on WSS 3.0 and MOSS. Many usability enhancements not available in Visual Studio. SharePoint and workflow only SmartObjects (Workflow SmartObjects are all of the SmartObjects you get for free as part of the process definition. SharePoint SmartObjects allow you to get access to much of the data stored in SharePoint). ADO.net data provider for custom reports and ASP.net pages. So what's not in K2 blackpoint? SmartObject Designer (You cannot create your own SmartObjects. You will have to build up or utilize existing services. The web services template or custom event wizards can be written to satisfy that. If you have data integration requirements, I would not discount want SmartObject bring to the table from the ability to create workflows in a rapid fashion.). Code editing (Reality as workflows get complicated it is very hard to avoid writing custom code. With K2 blackpoint you are forced to create custom event wizards to implement custom code. I would not cheat and implement custom code in a web service just so you can call it from a blackpoint. As well, there are times you need to have custom code events that work with process and activity instance data. Now there is more effort to do custom code and the this should be a consideration of the scalability of the process. ).